Not only did this week see the reveal of the official one-sheet for the highly-anticipated horror film, Scary Stories to Tell in the Dark, but during Sunday night's Super Bowl game, there were a number of teaser TV spots that premiered during the evening. Check out all four below (which are titled "Big Toe," "Jangly Man," "Red Spot," and "Pale Lady" (in that order). Scary Stories to Tell in the Dark is a upcoming film from director André Øvredal (Trollhunter) and co-written/produced by Guillermo del Toro. In the film, it’s l968 America ... Change is blowing in the wind, but seemingly far removed from the unrest in the cities is the small town of Mill Valley where for generations, the shadow of the Bellows family has loomed large. It is in their mansion on the edge of town that Sarah, a young girl with horrible secrets, turned her tortured life into a series of scary stories, written in a book that has transcended time—stories that have a way of becoming all too real for a group of teenagers who discover Sarah’s terrifying tome. 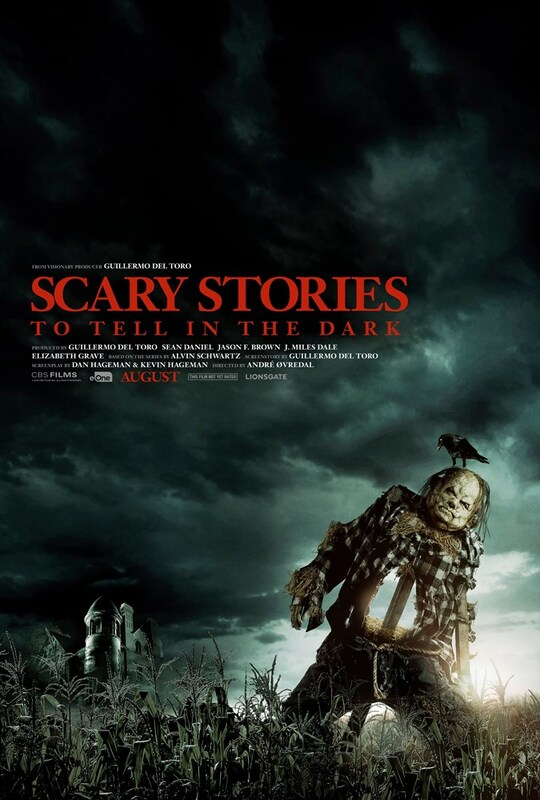 Scary Stories to Tell in the Dark is based on a series of children books from 1981-1991 from writer Alvin Schwartz and illustrator Stephen Gammell. The long-gestating project will finally see theatrical release on August 9th thanks to Lionsgate and CBS Films.